Sound City, Dave Grohl’s directorial debut premiered at the Sundance Film Festival this past January. The movie is in theatres and on demand now. In addition to making the film, Dave has corralled many of his the movie’s interview subjects for a limited set of shows in select US cities. So far they’ve played Park City and Los Angeles, and then on Friday, they announced their “one and only” NYC gig on Feb 13 at the Hammerstein Ballroom! Dave Grohl and Extended Foo Fighters and Nirvana Family to be Joined by Stevie Nicks, John Fogerty, Rick Springfield, Lee Ving of Fear, Rick Nielsen of Cheap Trick, Brad Wilk of Rage Against The Machine and More For One Historic Night. While this PR copy does not explicitly mention Sir Paul McCartney, you can read what you like into “extended Foo Fighters and Nirvana Family.” Also, Dave did mention in a recent interview with Marc Maron that “everyone” from the film would be playing a live gig at some point. Tickets for the show go on sale Monday, February 5 at 4PM EST. The Sound City companion “Soundtrack” will be available on March 12 via Roswell/RCA. 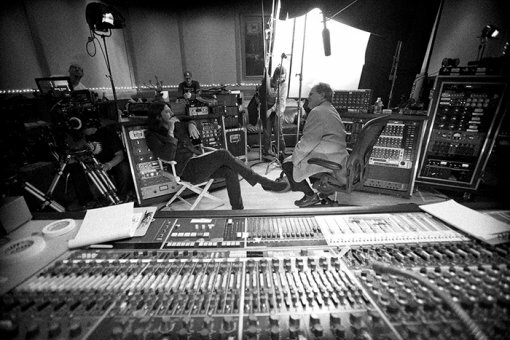 The film’s soundtrack, SOUND CITY-REAL TO REEL, will be released March 12 on Roswell/RCA and is currently available for pre-order at http://bit.ly/SoundCityiTunes, with all pre-orders instantly receiving first single “Cut Me Some Slack”-performed by Paul McCartney, Dave Grohl, Krist Novoselic, and Pat Smear.